I’ve been horse shopping – but not for myself. I'm looking for a second mount for my husband, Barry. The criteria is straightforward: endurance prospect, gelding, 15.2+ hands, 1000+ lbs., between 4 and 8 years of age, correct conformation, sturdy enough to carry a heavyweight rider, good feet and nice disposition. 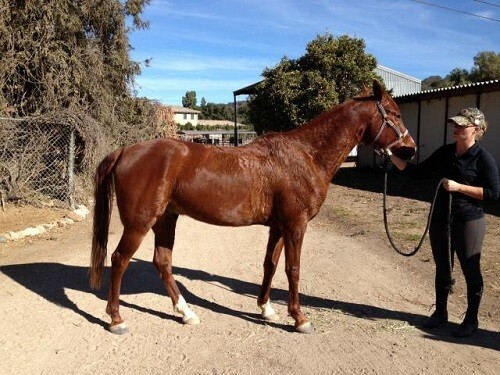 My internet search on numerous sites netted a list of about 20 horses in California. 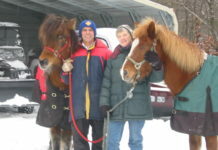 From there, I sent inquiries and pared down the list until I had narrowed it to five horses I wanted to look at. One of the five was abruptly pulled off the market. That left me with four prospects. Horse #1 was gorgeous! He was 15.3 hands, very correct and a nice mover. He had been shown quite a bit, which told me he was great amidst chaos and was a good traveler. Unfortunately, he had three strikes against him: he had never been out on the trail; he was 8 turning 9; and he had bad feet and a terrible shoeing job. He was barefoot in the back (great! ), but was shod in the front very close (shoes too small) and had long, contracted heels. 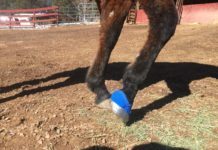 Knowing what I know now about transitioning a horse out of shoes, I knew it would be a minimum six-to-nine-month process to get this horse's front hooves back to their natural state. So, by the time he was trail trained and comfortable being barefoot, he would be 10+ years old. I passed on this horse. Horse #1. Nice show horse, but not what I was looking for in an endurance prospect. Horse # 2. He sounded too good to be true, and he was. This 5-year-old Arabian gelding was advertised as being 16 hands, 1500 lbs., with “too many good attributes to list.” The only attribute that turned out to be true was his height. He was dangerously skittish. His owner kept his halter on 24/7 because he was difficult to catch and he’d only been “sat on” about dozen times. He had a crooked front leg (knee turned out/tipped pastern/club foot). He was barefoot in the back and had nice feet. 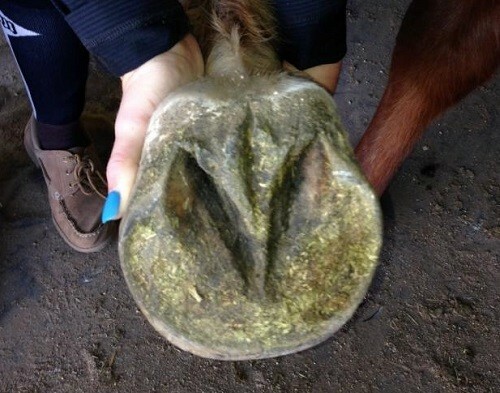 However, he was shod in the front and had the worst shoeing job I had seen in a long time. All this was beside the point because he was grade 2 lame at the trot on a longe line, and it got worse the longer he trotted. I stopped there. The owner was tearful, swearing he had never taken a lame step in his life. While I don't like to voice my opinions about another person's horse, I told the owner that her farrier wasn’t doing her any favors. Horse #2 was stunning, but….. Very crooked right front leg. Note the huge splints below the inside of the knees. The shoeing was horrific! Horse #3 was lovely. He was 15.2 (advertised 15.3) and 5 turning 6 years old. He had nice confirmation but a little light in the hind end, beautiful feet and had never been shod. Although the owner had him in training for nine months, he was very green and very insecure. 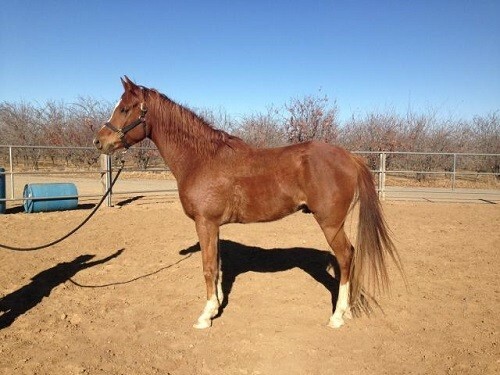 If I was looking for a project horse for myself, I would consider him because he was a very friendly, likeable horse. However, I decided that he was too small for my husband and didn’t have that easy-going disposition I was looking for. 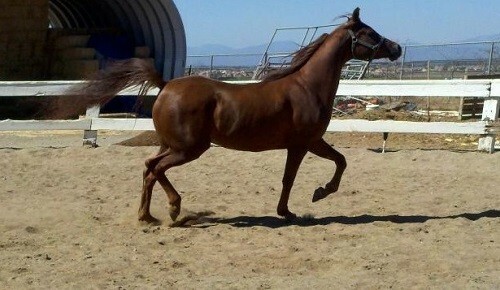 Horse #4 was a half-Arabian gelding, 7 turning 8 years old, 15.2 hands (advertised as 15.3) and 1000+ lbs. I liked him in all the videos I viewed of him and I liked him more when I saw him in person. He had been shown in dressage, ridden on the trail and had wintered out on an 11,000-acre ranch. He had an easygoing, willing disposition. He had nice conformation – big hip, very correct legs, nice shoulder and neck. He was slightly longer-backed that I would have liked but that wasn’t a deal killer. He had fabulous feet. Big, round platter feet. My eyeball guess is that he would wear at minimum a size 2W in the Easyboot Glove. Once upon a time, I would not have weighed the importance of good feet to the degree that I do now. Of course, I would look for good feet, but my criteria would not have included "never been shod." 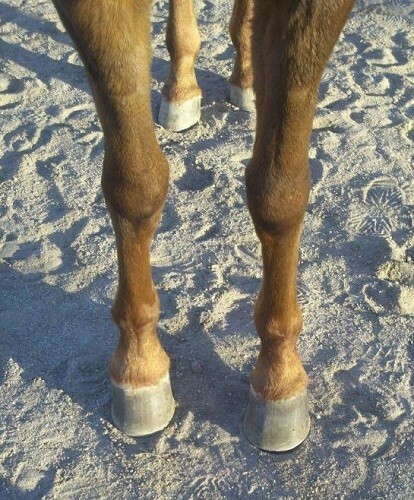 I’m no hoof specialist or veterinarian, but I have learned a lot in the last three years about hooves and transitioning a horse out of shoes. 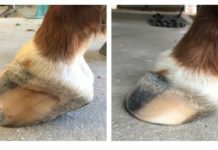 The two horses I looked at that were shod both had terrible shoeing jobs to the point that the shape of the foot had been compromised. 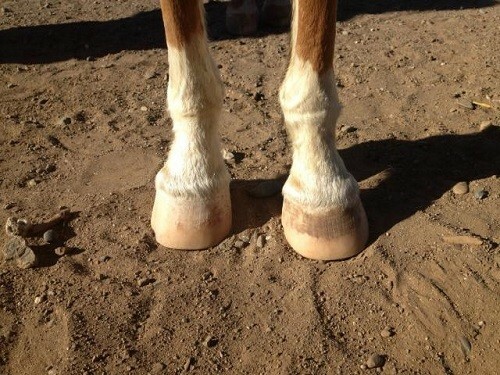 The two horses that had never been shod both had beautiful, round, healthy feet. 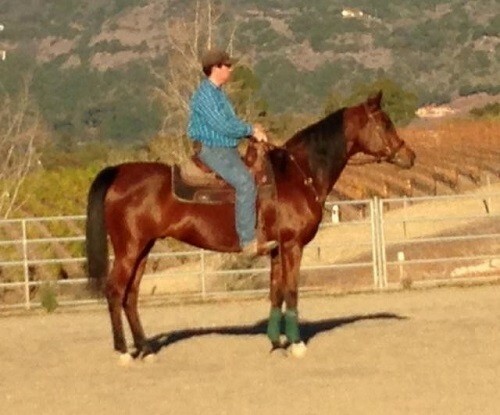 My horse shopping certainly served to reinforce what I have come to learn about the benefits of barefooting.